March has seen a buzz of activity in CRO, with 190 new research publications being uploaded from across the university. These new additions bring the total number of City’s research outputs available for download or request to nearly 14,000. The infographic below details a breakdown of upload and download figures for the month. Over 20,000 visitors from 168 countries have visited CRO this month, highlighting the global appeal of research published by our academics, and resulting in over 73,000 items from across the schools being downloaded. For the second month this year, the most accessed paper was Sociology lecturer Dr Carolina Matos’ ‘Globalization and the Mass media,’ gaining 643 downloads across the world. 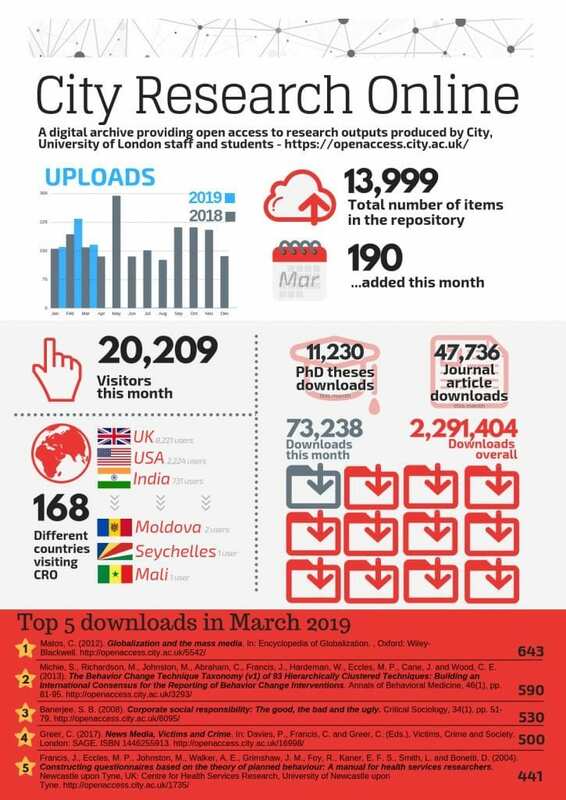 March’s figures give a strong indication of CRO’s importance for increasing the visibility and discoverability of our academic research, giving users in countries as far afield as Mali and the Seychelles free and immediate access to the research information they need. You can help build upon CRO’s growing archive of research by adding your work today. If you need help uploading your work, contact the Publications Team, or visit our City Research Online step by step guides on adding publications.